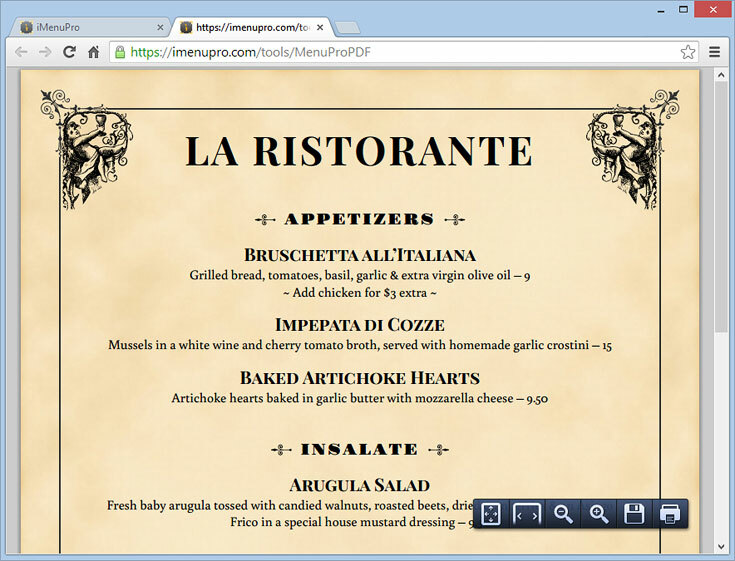 Step by step instructions for creating iMenuPro menus. Just signed up and ready to get started? This video shows you how to create a new menu from scratch and covers some of the basic design tweaks that you can do on any menu. 1 It lets you keep your food items in a list (a database) that is always accessible. This lets you create menus by dragging from the list rather than retyping. The list also allows content and design to change independently, letting you change your menu design without having to edit your list, and vice versa. 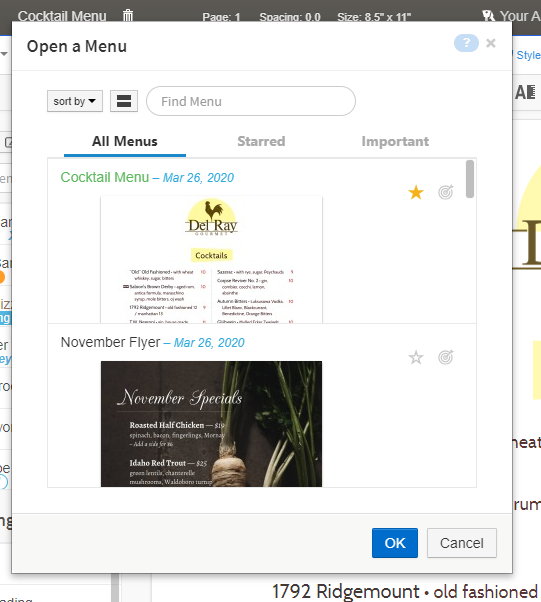 2 The design and layout of your menus is controlled by Menu Styles - blueprints that tell iMenuPro what design elements to use and where they should go. You're less restricted to how many items you can fit on the page. Your menu can be any page size since Menu Styles are size agnostic. You can preview and swap designs with 1-click using your actual menu text since all Styles are interchangeable. You can customize virtually every element of any Menu Style to create something truly unique. The last point is particular important because it allows you to 'brand' your menus to match your restaurant's personality, so you can avoid being stuck with an unoriginal design. Fill in Food Item fields for Name, Description and Price and then click OK. You can repeat this step to a add a few Foods Items. Next to Headings click the New button. Now click and hold the Heading you just created and Drag it over to the menu and Drop it. Next drag some Food Items to the menu in the same fashion - drop them under the Heading in the order of your choice. Once you have few items on the menu you can a) click and drag to change their order b) click to edit them c) hover and click the X to remove them (or click to edit and uncheck the On Menu box, then click OK). Next, try clicking the buttons on the toolbar to see what your menu looks like with different designs. Finally, at any point during the process, click on the toolbar (or use File > Create PDF to Print ) to create a PDF menu which you can print or upload to your website. You can switch Menu Styles at any time using the Design > Switch Menu Styles command to choose a specific Menu Style. Or you can click the Previous Menu or Next Menu buttons on the toolbar to cycle through the available styles. Page setup lets you set the paper size, margins, and orientation (portrait or landscape) for your menu. These are standard page sizing options that most users are familiar with from word-processing software. What's not so standard is that you can switch page sizes with any Menu Style at any time. Because with iMenuPro, Menu Styles are page size agnostic - they don't care what paper size you choose. So you're never locked into a certain size. You can even create custom odd sizes or poster sizes that no one's ever heard of, let alone designed a template for, as all Menu Styles work with all menu sizes. Use the File > Page Setup command to set or change your menu page size, margins, or orientation. Controls whether the menu will be printed in the normal fashion portrait (vertical) or lengthwise landscape (horizontal). Select your paper size — 8½ x 11 (letter), 8½ x 14 (legal), 11 x 17, 17 x 22, A3, A4, etc. If you want to create a menu that does not fit the sizes listed, choose Custom and then enter a Custom Width and Custom Length. 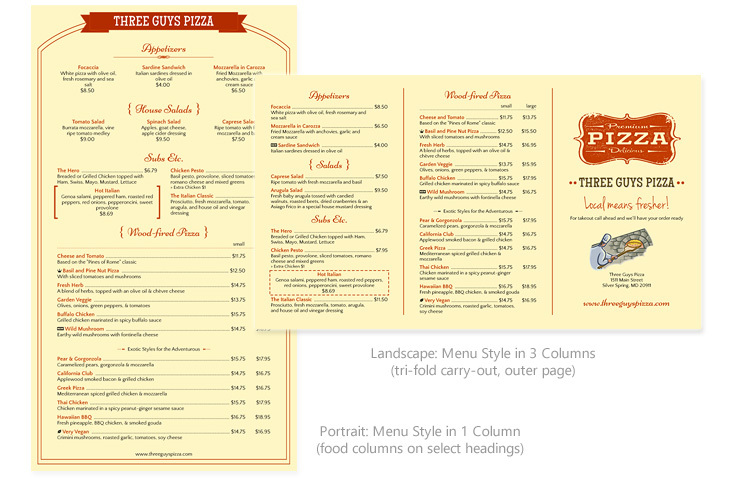 Each Menu Style comes with default margins to match the layout and design of the style. You can override these defaults by simply entering new values. For example, if you want a narrow page or a wide page, you can change the Left and Right margins. To return to the default margins of your current Menu Style click Use Style defaults for Margins. iMenuPro menu files consist of Headings, selections of Food Items from your food item list, and any artwork you have chosen or added. You can create and save any number of menus for retrieval. To create a new menu you can start from scratch with a blank menu, or make a copy of an existing menu and edit that. Opening, deleting, renaming, and copying menus are all done using the File menu commands. To create a new Menu use the File > New Menu command. iMenuPro will open a new Untitled menu for you that contains a few sample headings. For convenience, the new menu will start off with the same page setup, menu style, and design changes of the previously open menu. NOTE The default menu name for all new menus is Untitled Menu but you can change that by clicking the menu name on the navigation bar or by selecting File > Rename Menu. iMenuPro saves your current menu automatically when you log out, open a menu, create a new menu, copy a menu, and periodically every few minutes: see Tools > iMenuPro App settings > Auto-save for your current Auto-save time setting. You can also Save changes to your menu at any time by clicking on the toolbar or using the File > Save Menu command. Note that your Food Item List is saved after every food item edit, so you never have to worry about saving your foods. To open an existing menu use the File > Open Menu command or click on the toolbar. You'll then be presented with a list of menus you've created and the date each was last saved, sorted according to your chosen sort by setting and starred menus (starred menus appear at the top of the list). Select the menu you want to open from the list and click OK. If you have lots of menus you can also use the Find Menu search box here to find your menu by name, or toggle the list view to thumbnails by clicking . Once your menu is open it's name will appear in the upper, left corner of the iMenuPro navigation bar. You can delete the menu that's currently open by clicking in the upper, left corner of the navigation bar, next to the menu name. Once the menu is deleted iMenuPro will automatically open the last menu that was open. If no other menus exist, a new blank menu will be created for you. To rename a menu, open it and then use the File > Rename Menu Menu command or click your menu name in the upper, left area of the iMenuPro navigation bar. To make a copy of the current menu you have open, use the File > Make a Copy command. iMenuPro will then save your current menu and create a copy of the menu, renaming the copy to Copy of [current menu name]. When the command completes, you will be viewing and editing the copy. If you've made lots of design edits to a menu and decide you want to revert back to the original use File > Revert. Revert will undo all design changes you've made since you last opened the menu. It does not restore food item edits since food item text effects all menus, but it will undo food item ordering, or moving items on or off the menu, as well as any other design changes or heading edits you've made. NOTE Revert will not revert your app settings, or live-sync settings, or re-sync your menu if you're using live-sync on this menu. For most design edits, you can Undo the change by selecting Edit > Undo after you have made the change. After Undoing it, if you don't like what's been undone, you can Redo the change by selecting Edit > Redo. If you have multiple employees or people using your account, you can communicate instructions to them about particular menus with the menu comment feature. The comment is attached and saved with the menu but does not appear on the PDF menu, so any note you enter is non-printable. Comments are not updated in real-time if 2 or more users are logged into iMenuPro. But if someone new logs in and they open a menu you've saved, they'll see the comment you left for them. The comment also includes a date/time stamp so they can see exactly when it was last edited. To comment on a menu, use Insert > Comment and enter any text. Once entered, the comment will appear next to the menu on the right, or below the menu if you're using iMenuPro on a small tablet or smart phone. To remove the comment, just click the edit button on the comment and delete the text. iMenuPro lets you create and save advanced, high resolution PDF files for printing. PDF format has advantages of being transportable (you can open and print it from anywhere) and saves font and image vector data so text and graphics print smoothly at the highest resolution possible. The PDF files created by iMenuPro are also lightweight (optimized for file size) so you can safely use them on your website. 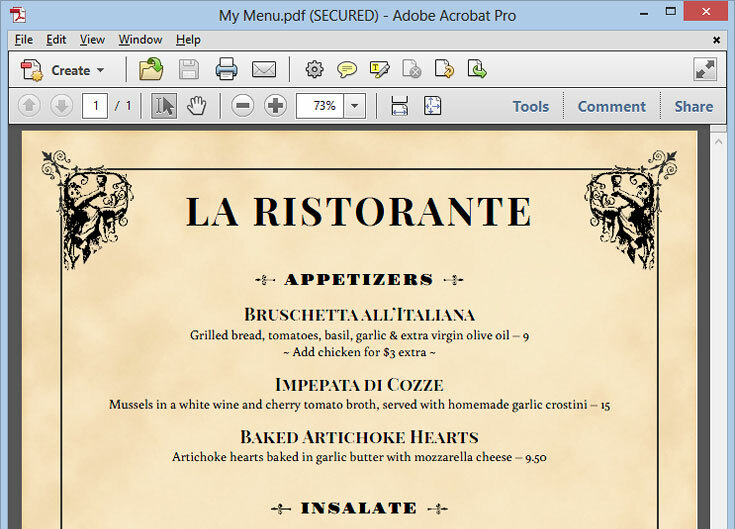 To create a PDF menu that can be saved to your computer for printing or emailing, use the File > Create PDF to Print command or click on the toolbar. A PDF file of your current menu will then be created and displayed in a new browser tab. Once the PDF file is displayed in your browser, you can save it to your computer or print it directly (the PDF Print and Save buttons are browser-specific but most appear at the bottom-middle or bottom-right of the browser window). Tip! 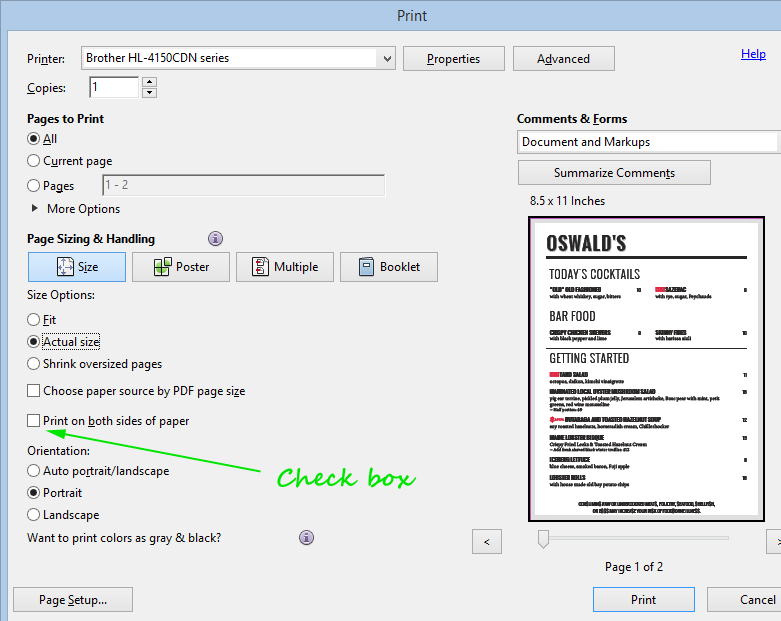 Many versions of Adobe Acrobat have a setting in the Print box that lets you select Fit or Actual size before printing. This can be useful if your ink jet printer (like many do) have substantial unprintable areas around the edge of the paper that chops off anything in that zone, like a menu border for example. If you find this the case, choose Fit and Acrobat will tailor the printing to your specific printer so everything prints nicely. If you don't have clipping at the sides, Actual size is the preferred choice for the best results. For example, if you're printing your PDF from Adobe Acrobat (the recommended method) check the box that says Print on both sides of paper. You'll also want to pick the correct Flip option (Flip on long or short edge). On tri-fold landscape carry-out menus you'll generally want to Flip on Short Edge to keep the backside from being upside down. If you're printing directly from a browser such as Google Chrome, it may have a similar option. For example, if you're printing your PDF directly from Chrome, check the box that says Two-sided. Of course, for any 2-sided printing you'll need a page 2 to print on the back of page 1. To create a 2nd page or more, see Add a New Page in the Tips and Tricks section of this Help guide. Duplicating your menu on a single sheet of paper can be a cost savings measure. If you want 2, 3, or 4 identical menus per sheet of paper, you can use iMenuPro's Table Tent Creator (add-on) under Tools. The Table Tent creator works with any menu page, on any size sheet of paper, to create 2, or 3, or 4 identical menus per page.